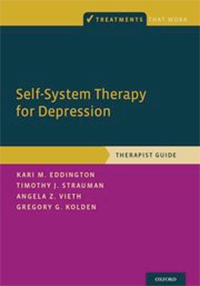 Timothy Strauman and Angela Vieth from Duke’s Department of Psychology and Neuroscience (P&N) have just published two companion volumes outlining a new treatment for depression called self-system therapy or SST. Along with colleagues Kari Eddington (University of North Carolina at Greensboro) and Gregory Kolden (University of Wisconsin), their newly available therapist and client guides provide the essentials for therapists to learn how to deliver the treatment effectively and for clients to get the maximum benefit from SST. The new volumes are the latest addition to the prestigious Oxford University Press series, Treatments That Work. Depression is one of the most common forms of psychological distress and can have devastating consequences for individuals and their loved ones. Decades of research have shown that there are many possible causes of depression. One such cause, which Strauman and his colleagues have studied extensively, involves problems with setting and pursuing important personal goals - put simply, the process of trying to be the kind of person you want to be. The Treatments That Work series offers innovative cognitive-behavioral treatment programs to help clients overcome a range of problems, including anxiety, panic, phobias, eating disorders, addictions, PTSD, and emotional and behavioral aspects of many medical problems. All the programs have been rigorously tested in clinical trials and are backed by years of research.